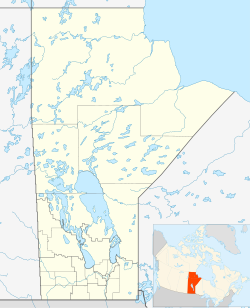 Lorette originally named Petite Pointe du Chênes, is an unincorporated community recognized as a local urban district in the Rural Municipality of Taché, located 25 km southeast of Winnipeg, in the province of Manitoba, Canada. Petite Pointe du Chênes was settled by Métis farmers, traders, freighters and buffalo hunters. The name was changed to Lorette by Bishop Tache to honour a priest in France who had made a considerable donation to the St. Boniface Cathedral. There are three elementary schools in Lorette. École Lagimodière, a French school; Dawson Trail School, an English school; and École Lorette Immersion, a French immersion school. Collège Lorette Collegiate is the community's only high school, offering English and French immersion programs. French grade 9-12 students travel to the nearby community of Ile-des-Chênes at École/Collège régional Gabrielle-Roy. There is a community library located in the Collège Lorette Collegiate. The major employers in the community are the Municipality of Taché, the Seine River School Division, Division Scolaire Franco-Manitobaine and All Star Concrete. Notre-Dame de Lorette, located on Dawson Road is a Roman Catholic church offering services in French and English. Notre-Dame de Lorette was built at a cost of $20,000 and completed in 1900. The architect and builder was Auguste Gauthier of Lorette. The task required a great deal of volunteer labour supplied by the community. The inside of the church features walls and ceilings adorned with oil murals by artist L.E. Monty of Montreal. The church is surmounted by three bells, which were poured in Haute-Savoie, France. The Complex Communautaire de Lorette Community Complex (or CCLCC) features a hockey rink, three-sheet curling rink, meeting rooms and a large hall. The Lorette Golf Course offers a nine-hole course along the Seine River. The Lorette Scorpions were the 2011-2012 WHSHL champions. In late 2017, bison located adjacent to Provincial Highway 405 (south of Lorette) had, repeatedly, found their way past their electrified fencing and onto the highway. Through social media, the bison, officially unofficially named Frederick "Freddy" The Bison, quickly became the LUD's adopted mascot by many of the residents. Moving past social media, the story was reported by the CBC. In addition to the Freddy's quick popularity with the residents as a mascot, he has also amassed a non-profit merchandising campaign in support of the CCLCC's new Complex. This has included custom birthday cards from the local flower shop to "Run Freddy Run" hoodies from the local designer. ^ "Population and Dwelling count of Lorette". Statistics Canada. Retrieved February 8, 2017. ^ "Local Urban Districts Regulation". Government of Manitoba. April 23, 2016. Retrieved April 24, 2016. ^ "Brazen bison won't stay home on the range in Lorette, Man". CBC News. Retrieved January 20, 2018. This page was last edited on 15 November 2018, at 18:51 (UTC).